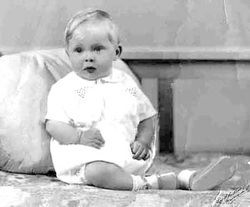 I was born in Nurse Harding's small nursing home at 109 Onewa Road, not far from Dr Duddings house on Northcote Point. My parents lived at 4 Gladstone Rd, which is now where the car park is located for the second hand Junk and Disorderly shop. I am the eldest of three children. Some time after I was born my parents moved to the corner of Stafford Rd and Richmond Ave behind McGill's grocery store and opposite the Methodist Church. I attended Sunday school for quite a few years there. Our house was very large with four bedrooms and an outside toilet, the washhouse was in the large shed at the rear of the house and had an old copper for boiling hot water so we needed plenty of firewood. My father had been injured in the 1914-1918 war at Gallipoli so was on a war pension as he had a lot of shrapnel in his head. This was something he never talked to me about. Money was fairly tight so dad operated on a cash and carry system. I did newspaper deliveries morning and night and picked strawberries. One Christmas holiday I was employed by the Post Office to deliver telegrams out as far as Hillcrest. Firstly I had to go the wharf and collect them from a messenger on the ferry- boat. Sometimes I washed Dr Dudding's car. Dad had a big vegetable garden in the back yard. Often he drove Mr Wharam's, the grocer, horse and wagon on deliveries around the district. The horse was grazed down Gladstone Rd. Dad also helped out at times at Simond's poultry farm in College Rd. 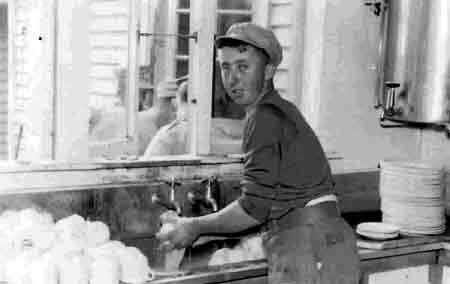 Jordan Bros Wood Yard in Queen St was another firm that he helped out at mainly cutting firewood and Dad also cut the doctor's lawns. Over a number of years we had various people staying with us some of them were from the Dingwell Orphanage. Marion, Brian, and Derek are names that I remember well. We also had a Mr. Chase who drove a bulldozer when Lake Road was being realigned. I will never forget being allowed to go for a ride on that massive machine on a Saturday morning. I am sure it was a D-8 that towed a large scoop. Sometimes we would have one or two of the US Marines from the Hillcrest Camp at home for a meal. As I grew older, Sulphur Beach became my favourite place. High or low tide we always had plenty to keep us occupied. When we wanted a change we would go over to Hall's Beach a good swimming place at high tide with a large raft anchored off the beach. When I started at Northcote Primary they tried hard to make me use my right hand for writing in the end they gave up and let me do my own thing. I went to Northcote Intermediate School on Onewa Rd and one year at Northcote College for secondary education. I played Rugby for the school and Rugby League for the Northcote club mainly on a Saturdays. When I was about twelve years old, dad bought us an 8ft clinker dinghy, this changed my whole outlook. I could go anywhere I liked as long as I stayed in Big Shoal Bay where there were plenty of fish to be had on most days if we were lucky. Bayswater and all day trips to Barry's Point with a suitable tide with my brother as crew were often under-taken. I was the Captain on the boat and one morning when the wind was from the northeast we explored the channel up to Lake Rd as far as the wooden bridge near where the tennis courts are now, very near where Smith and Davies yard is located. I still had to do most of the rowing on nearly all of our trips until we were able to purchase an Anzani outboard motor, one and half horse-power. Boy! the boat seemed to fly in my eyes. We were then able to go up to Kauri Point weather permitting, where we camped overnight on some trips then sailed down as far as North Head. After leaving school at 15, I went to work in Newmarket at H. Denton and Co as an apprentice Fitter and Turner for five years and Seddon-Technical College for night school. To save on fares I rode my bicycle out there most days learning to keep out of the way of the tramcars and off the tram tracks. The starting wage was £2.6s a week, £1 was for board. Not easy, but we managed. One Saturday about the time that I left school, I walked at low tide across to Needles Eye to have a look at a large keel boat that was being cleaned on the grid there. 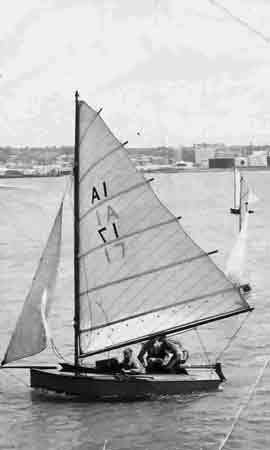 Ray Verran was the owner and that was the start of a long friendship and many years of sailing around the Hauraki Gulf. I learned so much about sailing from him and about the inner harbour in my own small sailing boats. I owned an idle along class I A 17 Outcry and raced with the local club. From the time Billy, my brother, went to school my mum went to work. At first she was helping out at Bryon's Home Cookery but later she worked at the Chelsea Sugar Works Canteen. Sulphur Beach has long been incorporated under the motorway. Over the years the sand has started to build up in places on the outside of the rock-wall, but it will never be the same as it was. My wife and I still enjoy living in Coastal Beach Haven not far from where we lived when we were first married just a short distance from the Beach Haven Wharf.